On January 6 dizmo and its proud team made one of their first public appearances. The teams were invited to be exhibitors at the NBCUniversal cable network Syfy’s event, “Who Will Take Your Brand Into the Future?”, part of VivaKi/Publicis Groupe’s “Bright Lights, Big Ideas” CES initiative. Many TV networks are looking to cut through the clutter of the CES. The NBCUniversal cable network Syfy’s event was designed to do just this. Being part of this event is a great honour as only four products are chosen to exhibit. These are those that the event organisers consider to be amongst the most innovative in the world. The idea behind the event is to showcase technology that is not on the CES floor that year but will be the years after. Syfy sparks the imagination by creating immersive storytelling experience for its highly imaginative audience of what they term Igniters. The event opened with a talk about igniters, these people are inventive and inspired people that shape the world we live in. Curious, optimistic and innovative, Igniters are the first to find and try new things, which is why Syfy is eager to associate them to brand new technologies. Syfy believe these consumers can accelerate the growth of brands and that Syfy has more of these types of people than any other television network. After the talk Syfy then introduced hot, game-changing tools that will reshape the way we all experience entertainment and…dizmo was proudly among them! 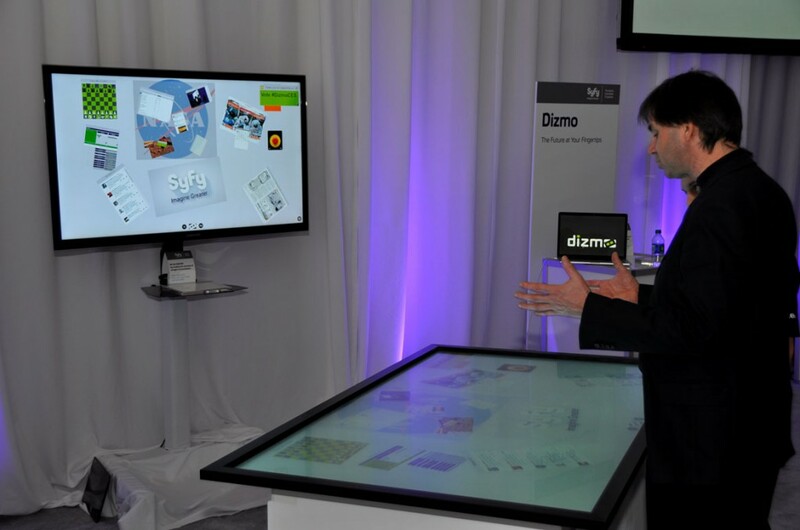 dizmo organized a demonstration using two 75” touchscreen panels and one 55” panel, plus several tablets. To put the technology and product in the context of Syfy and their target audience of Igniters, dizmo built a simulation providing a futuristic view of the ‘home on the moon’ and several user cases where dizmo facilitates life out there. 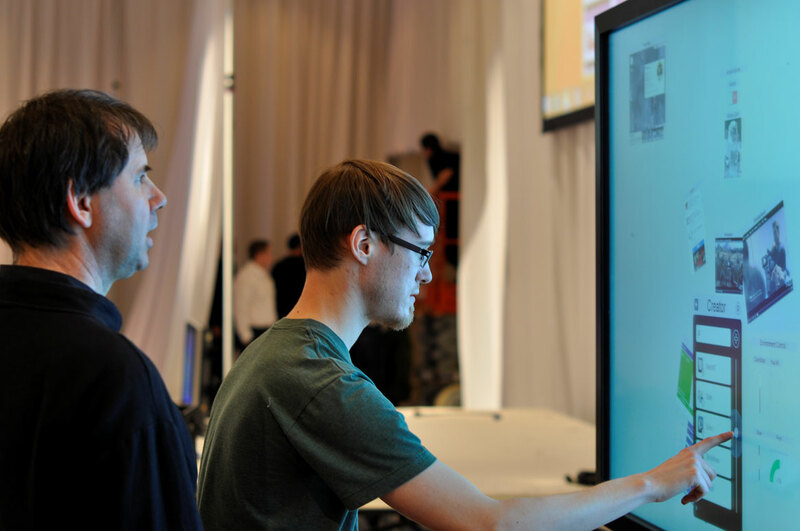 A large vertical touch screen panel simulated a fully digitalized wall in the home and a horizontal one represented one of the many digital surfaces of the home. Through that people could interactively access digital content, services, games, and social networks, freely manipulate them with a flip, tap or a pinch of their fingers and also monitor and control the home environment. Additional interactivity was provided by linking the two touchscreen panels and with the tablets, a quite unique feature of dizmo. The dizmo message was clearly: igniters and early adopters in general don’t have to wait for their homes on the moon to be ready to use dizmo! They can have it all and now, in their homes, offices and on the go, boosting their creativity to previously unimaginable levels. “It was a unique and extremely rewarding experience”, said dizmo CEO Matthias. “As the brand who celebrates, encourages and stimulates imagination, Syfy is a home for Igniters and creates entertainment with them in mind. Innovation is at the core of everything Syfy does and to be associated with that for dizmo is just terrific”. CES continues to be THE event of the year for consumer electronics at large; as electronics becomes pervasive and the age of the Internet of Things starts, CES enlarges its scope to more and more market segments and becomes even more relevant to all industry players. To be part of a sponsored event is certainly one of the most efficient ways to participate in this incredible event; we proudly did it with Syfy and it was an awesome way to start 2014: the year of dizmo!